The ever popular Just Play football programme will be teaming up with rugby, cricket and netball to provide an afternoon of fun activities to get the kids active within their own community. The four sporting codes will provide a variety of activities for keen youngsters to join their peers and participate in fun filled activities through a rotational system that is set up to offer the children a chance to experience all the different sports codes on offer. “The village festivals have been very successful thus far with children able to make their way down to their local field after school and parents also taking a keen interest in the continual event, we look forward to bringing this fun filled afternoon to Titikaveka today,” says Michelle Paiti, Just Play Manager. “We would like to encourage all the children in Titikaveka and around the nearby villages to attend this fun sporting festival,” Paiti says. The Village Festivals that have taken place around the island have seen the attendance of the children grow each time since it first took place in Tupapa earlier this year. To date the villages of Matavera, Nikao, Rutaki, Arorangi, Takuvaine, Ngatangiia, Avatiu and Tupapa have enjoyed this popular event. This sporting initiative was instigated by Just Plays Project Manager Michelle Paiti with the support of Public Health’s Karen Tairea to promote the importance of physical activity and social development while also assisting in the awareness of important health messages which will help in combating NCD’s (Non-Communicable Disease). This month’s health message is ‘Hydration’ and Karen Tairea of Public Health will attend the activity to talk to the young ones about the importance of always keeping hydrated especially when playing sports and the best drinks for this. “It is great to see that sport and in particular football through Just Play can play a major role in promoting physical activity to assist in the awareness of non-communicable diseases here on our island,” says Paiti. “With the assistance of Cook Islands Rugby, Cook Islands Cricket and Netball Cook Islands the youngsters will hopefully enjoy positive experiences which will stay in their minds and help them continue to be active throughout their lives. 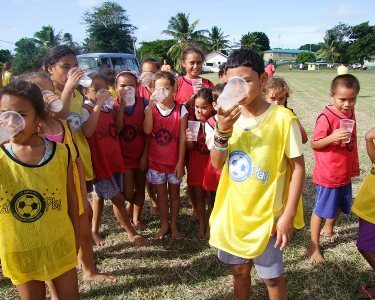 Cook Islands Football acknowledges the support of AusAID through the Just Play programme and their local partners who continue to support this initiative.